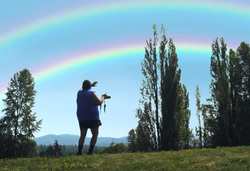 DOUBLE RAINBOW GUY from Zen Dope on Vimeo. You may want to adjust the volume on the lower right corner of the video. There is much to tell about the Esoteric Secrets of the Rainbow. Common knowledge to adepts and secret society's, rainbows are portals to holographic realms in higher dimensions on planet earth. There is more to it than merely seeing one, but they are believed to appear when a person ascends in consciousness, one for every soul who achieves this feat of higher mind and attracts or accesses a higher dimension. It is also believed that the etheric realms, the "holo" realms and the celestial realms are accessed by rainbows. Rainbows are sunlight filtering through water, rain and mists. Angels and Faeries are most often linked with rainbows, for this "realm gate" reason. Holographic dimensions of parallel realities are said to overlay the actual base physics of material reality and these parallel realities of a differing nature in light, leak through the rainbow. It is believed that the window, portal or realm door opens both ways, briefly. Fascinating lore and tales come from this enigma, stories far far back in history and mythology. One day I will tell you more about the physics and chemistry of these astral and holographic realms. I once wrote a paper on after finding that science knows all about these dimensions of color and light and even weight, but alas, not tonight, it's well past midnight. My coach has arrived. It is also posted below for your immense viewing pleasure. The music used for this Zen Dope Video, above, is by Dexterboy 124 :Epic Shiz. I like this man's musical talents. Find him on you-tube as well.